"These stories are based on an actual double suicide (shinju) committed sometime between 1704-10 by the geisha Koina and her lover Inanoya Hanbei. The story staged many times with an ever more baroque plot, culminating in Tsuruya Nanboku IV's 1821 Sanga no shō Soga no shimadai in which Sasano Gonzō, accused of committing adultery, disguises himself as a Fukugawa prostitute named Koina, while the woman he was accused of having an affair with disguises herself as Hanbei. As in all versions, the two lovers eventually kill themselves." The poem is by Suihenjin. 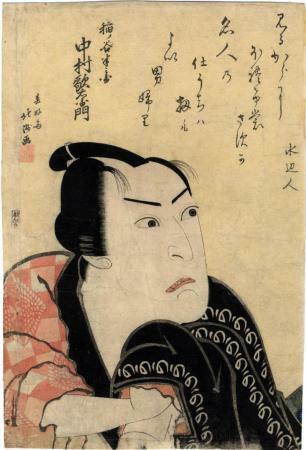 This print is illustrated in black and white in Ōsaka Kagami 大阪鏡 by Jan van Doesburg on page 35.